Missed Titans, Storm and Warriors this week - it does happen. 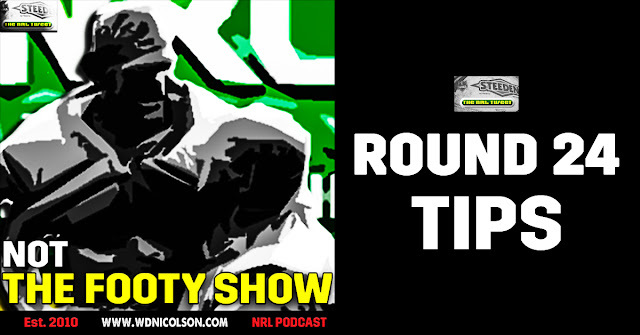 Round 26 Tipping Skinny: Stick with the favourites if you are ahead in your tipping comps... but if you need an upset or two - Eels over Warriors, Souths over Dogs and Knights over Dragons have potential - we're only going with the first option. Looks like we need 6/8 in Round 26 to end up with a 70% tipping rate for the year - but this is by far our best percentage since Year 1 when we went at 65.1% in 2010. Missed Bulldogs and Sharks this week - we'll take 6/8 though! 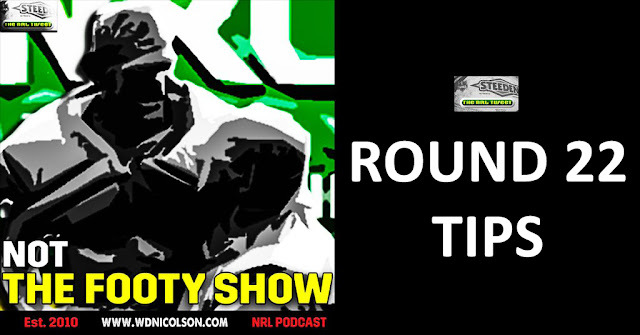 Round 25 Tipping Skinny: We're so late this week that no reasons are good reasons! That week hurt... again. Liked Canberra both the last two weeks but had to respect the ladder at this stage of the season. Cowboys, Sharks and Warriors were bad in a word. So there's your 4/8 week kids. Round 24 Tipping Skinny: Cross those fingers the favourites come good again this week... otherwise we might dip below 70% for the year... Broncos-Dogs is a real tough one but respect the ladder, as is Sunday's Dragons-Chooks but it's hard to tip Saints at any time. The rest 'should' win. That week hurt... Eels, Raiders, Warriors and Tigers burnt us. We knew Ennis was out but still couldn't bring ourselves to chance to Canberra late... should have obviously! Round 23 Tipping Skinny: It looks like our great tipping streak has gone off the rails... hopefully for just one week though. We want to finish above 70% tipping for the year so we need a 6/8 at least this week. Canberra v Storm should be a cracker but it's hard to tip against Melbourne esp with Austin in doubt. Tigers-Titans looks like a toss of the coin but call it a hunch on the Gold Coast this week. Evidently we all get the 'draw' correct according to NRL.com Tipping... so the BRONCOS COST US AGAIN!!!!!!!!! Round 22 Tipping Skinny: If there's one thing we've learnt from the past two months is that you don't tip the Broncos... so what are we doing? Tipping the Broncos. Hey they are up against the Dragons so can you blame us? Sharks-Raiders should be a cracker (let's see if Canberra are the real deal before we tip them at Shark Park), as should Tigers-Cowboys (pending JT's fitness). Most games fairly obvious at this stage - stick with the Top 8 contending teams... and the one that just signed Jarryd Hayne.